This week and next week we reflect on three very special people in our church family who have crossed over to the kingdom. This was their mantra; I am sure. First Karen Locke whose home going we had last Friday. Karen was always active and helpful in our church family. Needless to say through the years she had many sicknesses but she kept going–being a good wife to Kenneth, making a home and raising their three children. She was a woman of business, leader in our church helping people prepare for home-goings and she loved the Lord with a deep and abiding faith. Then, we have Elder Jack Straughter whose wake will be today at Austin Layne, Normandy Chapel from 4-7 p.m. we will have his home-going tomorrow, Monday, March 16 at 11 a.m. here in the church. 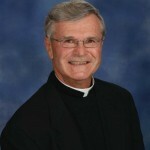 He has been a Eucharistic minister, a handsome gentleman who assisted people all the time. He was president of our finance board for many years, often counting of the collections. He was truly a loyal servant whom we will miss. We will need someone to take his place and the many good things he did as well as someone to take Karen’s place, also. Rest in that sacred Word today and God continue to be with you on your Lenten journey. Check yourself out and see how well you are doing in your Lenten efforts. God bless you!